Outside of the Archeophone, this is the only other attempt I am aware of to commercialize the manufacture of this type of machine. 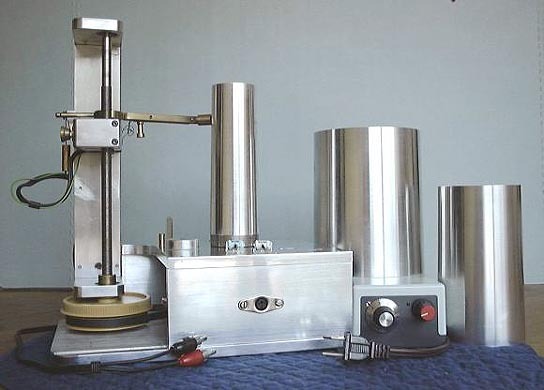 Only very few of these machines were built - each individually crafted by machinists to the highest standards - for Symposium Records of Hertfordshire, England, in the mid 1990s. As I understand it, these were first production units and so much R&D and time went into the work that they eventually decided to disband the project. I bought the machine in 1999 from a sound engineer in Maryland, David Giovanonni, who was one of the lucky winners of a drawing or lottery were the few machines that made it off the first production run were allotted. I am not sure how many of these exist, but so far I have not located another one. Those accustomed to playing cylinders on vintage machines are at first struck by the unusual vertical positioning of the mandrel. 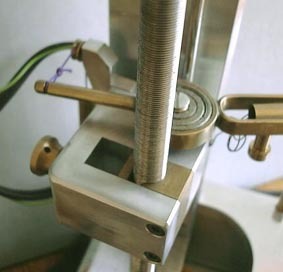 This design lets gravity do the work of holding the cylinder in place - a welcome feature when playing rare or cracked cylinders (the ones most easily shattered by that extra bit of pressure required to hold them on a horizontal mandrel). 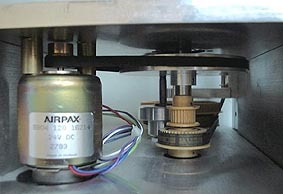 The power control unit steps down 120V AC to a variable DC voltage that turns the mandrel. 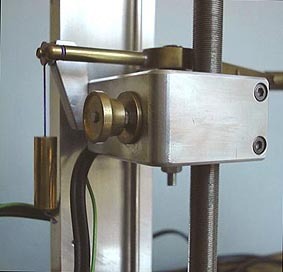 Even the quietest Edison motor cannot compare to the smooth and stable rotation of these precision-lathed mandrels. The range of rotation was never precisely measured, but it seems to be roughly 80 to 200 RPM. The DC voltage makes it infinitely variable. A tachogenerator can send precise speed measurements to an oscilloscope or frequency meter. This machine was special-ordered so that the Shure cartridge is wired for stereo output. This is preferable to strapping the output into mono, as it gives the user the option to electronically adjust for canting, and to fine-tune and mix the left/right signals. Of course the unit plays both two- and four-minute cylinders. 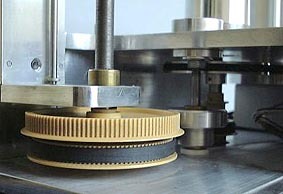 A toothed belt and pulley system controls the travel speed of the playback arm. The Symposium is a well-crafted but finicky machine that demands patience to operate. We have learned its idiosyncrasies over the last few years and have achieved outstanding results. Symposium stopped delivering these phonographs in 1997. No more are being made, and no more will be made. They hardly ever come up for sale. 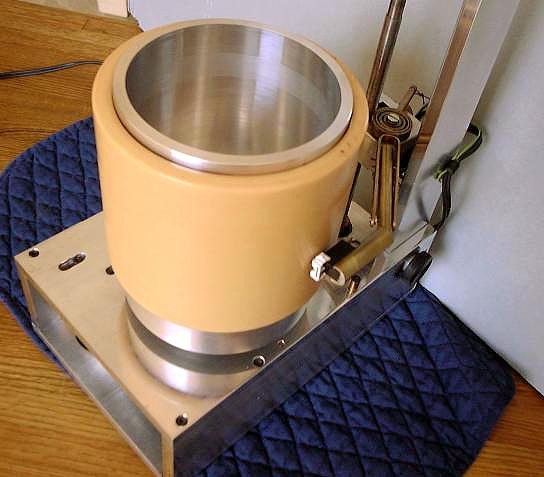 The whole Symposium Model 1134 player with three mandrels and exchangeable styli.